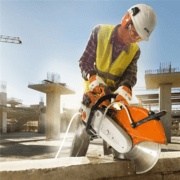 This Stihl quick-cut concrete saw is equipped with electronically controlled fuel injection for predictable smooth running every time. This feature also makes starting the saw easier with no choke required as it automatically detects the saws hot or cold condition. While the controllers intelligent system uses data to determine the external temperature, altitude and fuel grade to calculate the quantity of fuel that is needed to start the saw. This only a few of dozens of benefits the fuel injected saw has! And electronic water control for easy operational use. The applicable 350mm/14" cutting disks can cut up to 125mm deep ensuring you can have all jobs covered. 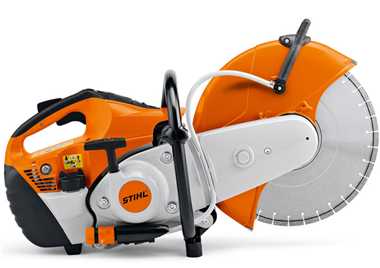 Equipped with Stihl's anti-vibration system, guarantees the operator won't have any trouble handling and controlling the machine. The long life air-filter means longer periods in between servicing schedules and the decompression value ensures an easy start all the time. The 2-Mix engine reduces fuel emission and fuel consumption producing a well rounded concrete saw that can be operated by hand or placed in Stihls FW 20 Quick-Cut saw cart. This innovative feature is equipped with an advanced stratified charge system boosting power all while lifting the fuel efficiency and delivering less pollution. Resulting in a cleaner and more productive engine. This feature ensures that 80% of the dust particles are broken down and released into the surrounding area. Extending the cleaning intervals for the foam pre-filter. 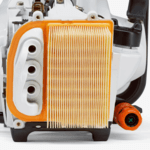 The implementation of Stihl's buffer and spring elements nullify the engine vibrations before they make their way to the operators arms and hands. Making operation of the Stihl quick-cut saw by hand easy and pleasurable. 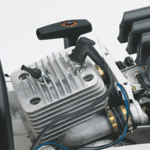 The decomp valve needs to be pushed down when starting which minimises the compression pressure when you pull it over making it easier to start. The decamp value is semi-automatic meaning that it has to be manually engaged but it will automatically disengage when your equipment kicks over.